Honor the Earth map on Enbridge Line 3. 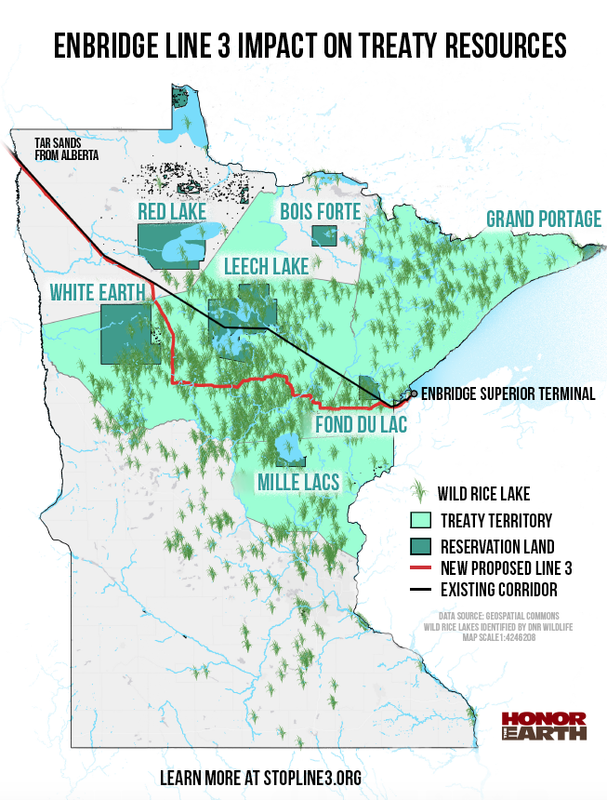 Second in a series of critiques of the Minnesota Department of Commerce’s final environmental impact statement on Enbridge Line 3, a proposal to expand and reroute a tar sands crude oil pipeline through northern Minnesota. This project threatens the Mississippi River and wild rice areas, violates treaty rights, and is unnecessary for the state’s energy security. The Minnesota Public Utilities Commission is taking public comments on the adequacy of the EIS until 4:30 p.m. Oct. 2. To learn how to submit comments, click here. The Line 3 environmental impact statement (EIS) is inadequate because Commerce fails to look at whether or not this project is needed, given the environmental risks it will create. Commerce released its draft EIS in May, triggering an avalanche of public comments. Some critics questioned the need for the project, offering testimony that Minnesota’s petroleum sales are down 19 percent since their 2004 peak. In the final EIS, Commerce argues that the questi0n is outside the scope of the EIS. Here is how it responded to citizen criticism (Appendix T, page T-3). … this EIS does not assess the overall project need. Instead, the EIS evaluates the environmental impacts associated with the range of reasonable alternatives to aid the Commission’s evaluation of the need criteria set forth in Minnesota Administrative Rules. Second, the EIS saw fit to include informati0n on petroleum supply but it ignored demand (that is, the need for the project). Nothing prevented Commerce from including this information. The PUC needs the information. It is relevant to the debate. Citizens have raised the issue and provided the data. The EIS does not include that analysis. The EIS does not consider a “No-Build”option, so the PUC has no way of comparing the difference between approving and denying the Certificate of Need. The EIS does, however, include an analysis of Line 3’s job creation and potential property tax benefits. If Commerce wants to take an expansive definition of environmental impacts to include jobs and tax implications, surely it could include an analysis of project need. Being selective in the facts it chooses to present is a form of bias. The Enbridge Mainline system, together with four Minnesota Pipe Line Company pipelines that carry crude oil south in a corridor from Clearbrook to the Twin Cities area, supplies approximately 400,000 barrels of oil per day to Minnesota’s two petroleum refineries. These refineries use about 15 percent of the crude oil crossing into the state, with the bulk of the products refined from Canadian crude oil. Nearly all the heavy crude oil refineries in the Upper Midwest receive a portion of their crude oil, either directly or indirectly, from the Enbridge pipeline system that crosses Minnesota. How is information about petroleum supply relevant in the EIS but not petroleum demand? Commerce justifies excluding project need from its analysis because an EIS is all about “environmental impacts.” Yet, at the same time, Commerce includes non-environment impact information in the EIS — the upside of job creation and property tax increases — that favor pipeline approval. In addition to direct Project-related employment and payroll spending, a large portion of the construction-related expenses would be for construction materials, supplies, equipment, parts, and other goods and services such as fuel, hardware, and parts. The Applicant estimated the material costs for construction of its proposed project in Minnesota to be $438.9 million. You get the idea. The EIS goes on about the project’s economic benefits which put the project in a favorable light. But these have nothing to do with environmental impacts on lakes, rivers and wildlife. This is not a jobs impact analysis, but, as Commerce said, an environmental impact statement. This digression suggests Commerce’s bias towards job creation compared to its lack of interest in the need for the project. Again, this is not a tax impact document, but Commerce chose to throw this in, and did so with selective informati0n. Clearwater and Red Lake counties could end [up] having to refund more money to Enbridge than they raise in an entire year from all property taxpayers, reports the Star Tribune. Enbridge has appealed five years of taxes claiming the Minnesota Department of Revenue unfairly valued its pipeline network in the state. This overvaluation resulted in much higher property tax payments argues the company. Property tax revenue used in the impact assessment was based on the appraised value of the pipeline easement and the state and local tax rates. Enbridge has appealed the amount of property taxes it paid between 2012 and 2016, alleging that the Minnesota Department of Revenue overvalued the value of the pipeline property, resulting in overpayment of taxes to counties and Minnesota. The appeal has not been settled at the time this document was prepared. This revenue would be in addition to the amount that the current landowner pays and represents additional revenue to the county and the state. Commerce uses a gentle hand in describing the impact of this tax challenge. It says the issue isn’t settled and that ignores the size of tax relief Enbridge seeks, a revenue cut that threatens seriously county budgets. The EIS still tries to make a case that the project represents “additional revenue.” It ignores the risk to counties of being dependent on this revenue source which, by Enbridge’s reckoning, will be gone in 30 years, leaving a revenue cliff.